Here are some videos of people we have worked with and work in progress. Most are with music but some are without music. Keep checking back as we are constantly adding new ones. March 2009 Hannah Mears and Ernford Ballotbox - Manor Farm Aff. BD. They came 7th and it was there 1st BD music together. March 2009 Joanna Mears and Rio III - Manor Farm Aff. BD. They came 1st with 73.5%. You'll notice Rio didn't like the arena doors! February 2009 Jen Englishby and Woltaire - Addington Winter Regionals, they came 3rd. 3rd August 2008 Fiona Roberts and Southern Comfort - Floorplan with music over laid. Music by Kenny Ball and his Jazzmen. 11th June 2008 John Mears and Rio III - Novice Affiliated they came 1st with 75%. Music by Kenny Ball and his Jazzmen. 13th April 2008 Louise Bennett and Tangawizi - Floorplan with music overlaid. Music is all Moulin Rouge. 13th April 2008 Wendy McKay and ET Supa Solo - Floorplan with music overlaid. Music is strictly Ballroom. 13th April 2008 Vicky Spanswick and Denver Sky - Floorplan with music overlaid. Music is Bopping Music. 27th March 2008 Sue McGregor and Limbo Dancer - Floorplan with Music overlaid. Music is Swing Dance Music. 27th March 2008 Siobhan Gilligan and Pathfinder Tigger - Floorpan with Music overlaid. Music has a soft swing theme. 27th March 2008 Eloise Thomas and Jonny Rotten - Floorplan with music overlaid. Music from Queen. 27th March 2008 Eloise Thomas and Jonny Rotten - Floorplan with music overlaid. Music from Lord of the Dance. 27th March 2008 Catherine Barnes and Vanilla Skye Take 2 - Floorplan with music overlaid. Music is the Glory of Brass, brass band music. 8th March 2008 Shirley Cole and Stormin Norman V - Floorplan with Music overlaid. Kenny Ball and His Jazz Men. 31st March 2008 Serah Goldsworhy and Shiraz - Floorplan with Music overlaid. In the style of Take That. 2nd March 2008 Joanna Mears and Rio III at the Freestyle Challenge finals at Hartpury College. They were 6th overall and the team were 2nd. 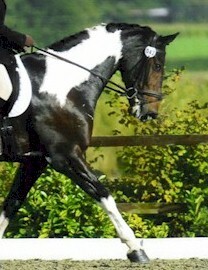 This is a Novice test which has a halt and rein back in the test. 21st February 2008 Jen Englishby and Woltaire at BD Winter Semis where they came 2nd and qualified for finals! 21st October 2007 Sarah-Jayne Bowers and Romana - Floorplan with Music. A Lipizzaner Mare with attitude! 21st October 2007 Celia Waldron and Sam - Floorplan with Music. Bond Themes and Man frmo U.N.C.L.E. 10th July 2007 With Music overlayed - Jen Englishby and Gizmo. 10th July 2007 No Music - Jen Englishby and Gizmo running through their floor plan prior to adding music. 10th July 2007 No Music - Jen Englishby and Joanna Mears practising for pairs dressage. 8th July 2007 Joanna Mears - Rio III at the Aspley Guise & District Riding Club dressage competition. 8th July 2007 Hannah Mears - Mango at the Aspley Guise & District Riding Club dressage competition. This proves anyone can go Freestyle. 8th July 2007 Jenny Tuffnell - Dalcotes Beretta at the Aspley Guise & District Riding Club dressage competition. 8th July 2007 Novice 21 No Music - Joanna Mears - Rio III at the Aspley Guise & District Riding Club dressage competition.